Fat, forty-four, father of three sons, and facing a vasectomy, Mark Obmascik would never have guessed that his next move would be up a 14,000-foot mountain. But when his twelve-year-old son gets bitten by the climbing bug at summer camp, Obmascik can’t resist the opportunity for some high-altitude father-son bonding by hiking a peak together. 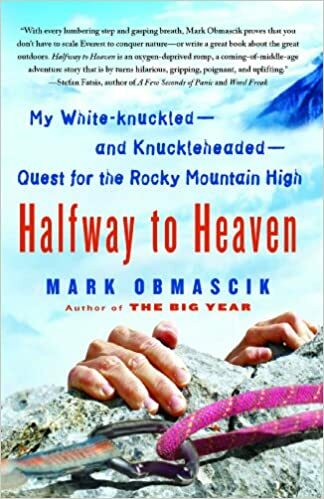 After their first joint climb, Obmascik, addled by the thin air, decides to keep his head in the clouds and try to scale all fifty-four of Colorado’s 14,000-foot mountains, known as the Fourteeners—and to do it in less than one year. The result is Halfway to Heaven, a rollicking, witty, sometimes harrowing chronicle of an outrageous adventure that is no walk in the park. This "hilarious midlife picaresque" (Publishers Weekly) has garnered wide critical acclaim, was named an "Editor’s Pick" by Parade, won the 2009 National Outdoor Book Award for Outdoor Literature, and made one reviewer laugh so hard he "blew beer out of [his] nose" (Colorado Daily). Like the author’s critically acclaimed debut, The Big Year, it brings a keen eye and sharp humor to an obsessive subculture: climbers who share the author’s crazed passion of scaling all fifty-four of the famed and feared Fourteeners.